Thank you for taking the time to view and enquiry about our fantastic Davenport Vacation Rental Villa near Disney. We have a total of 5 properties some side by side so no matter how large your group is, we can accommodate you. 'Sunset Villa' is the complete ultimate in luxury. This magnificent 6 bed, 4 bath (3 mastersuites) villa is located on a very prestigious private development only 15 minutes from Disney and 25/30 minutes from all the other Orlando attractions. 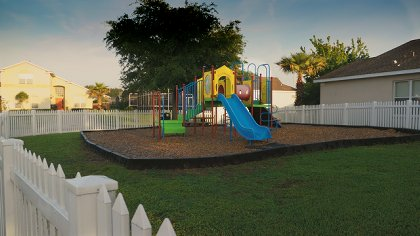 The house sleeps up to 17 guests and is perfect for large and multiple families or groups of friends who want to come and enjoy the fabulous facilities and attractions that Davenport, Disney and Florida have to offer. The villa is situated on a large south west corner plot some 17,000 sq ft in size. The house is very spacious with 3300 sq ft of living space. The villa is very impressive as it stands on its own and has a long 95ft driveway to the front of the house. The rear garden/yard around the pool area is all fenced in so you have a totally private garden/yard and you are not overlooked. The villa has been furnished to an exceptional high standard. There are 6 bedrooms in the villa, Bedroom 1 has a Kingsize bed, private bathroom with a corner bath, shower and a walk in closet. The bedroom has a 32" LED TV and ceiling fan. Bedroom 2 has a Kingsize bed, private bathroom, a 32" LED TV and ceiling fan. Bedroom 3 has a full private bathroom, bedroom 4 is our family room with a Queen bed and a twin bed, bedroom 5 has a Queen bed and bedroom 6 is our Disney themed room with a set of trip bunk beds and a twin bed. All of these have TV's. The bedroom layout in full is as follows. Bedroom 1 - Kingsize bed - Mastersuite, 32' LED TV. Bedroom 2 - Kingsize bed - Mastersuite, 32' LED TV. Bedroom 3 - Queensize bed - Mastersuite. Bedroom 4 - Double bed. Bedroom 5 - Family bedroom, double and a twin bed, sleeps 3. Bedroom 6 - Disney bedroom, triple bunks and a twin bed, sleeps 4. We have just upgraded and added to the villa the latest in high speed wireless broadband internet access. There is a fantastic gamesroom that has in it a pool table, table soccer/foosball, colour TV, PlayStation, CD player and two large sofas. The pool area is the biggest on the development and is truly magnificent. The large completely private pool faces south-west so it has the sun on it 365 days of the year. There is a separate 5 person Spa/Hot tub. The decking within the screening is 55ft x 25ft, so no matter how many guests are at the house, there is plenty of room to relax and enjoy the Florida sunshine. On the decking there are sunloungers, table, chairs and floodlights so you can enjoy the evenings outside. We have also just had built, an additional second pool decking area that is 24ft x 18ft in the garden/yard that is outside the screening area. There are sunloungers on this decking. Inside the villa there is dining room, kitchen and a living/family room with a 51' Samsung LCD TV, DVD player and CD player. There are two leather sofas with recliners and a separate leather chair. We are the owners of this house and we have been since it was built. We have tried to make 'Sunset Villa' that perfect vacation destination for you, your family and friends. We look forward to speaking with you all very soon. 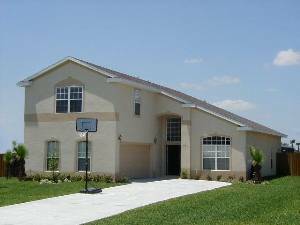 We do have several other Disney Orlando Villas if you need more than one vacation home. We do have another 6 bedroom villa that is directly opposite this one and they are side by side. I do look forward to hearing from you very soon. Villa was nothing like photos on website it was filthy rundown pool area looked like a bomb had hit it the screening round pool area was all ripped the pool was filthy .hole in plaster on stairs where previous guest had punched it .we had no choice but to stay one night then moved out early hours into another villa which was lovely we had to pay again but it was worth it .still not had any money back from Lee Pierce but are taking further measures ie small claims court and also Florida health & safety dept and also tax & revenue dept. hoping to stop it happening to others. Thank You so much for being a part of the great vacation my family and myself had. The villa was very spacious and comfy. The area was quiet and a great place to wind down after a long day of entertainment at the theme parks in Orlando. The children loved the pool, even after the long days. The villa was in a great location. There were stores for every need in very close vicinity from the villa. We are already planning a trip for Orlando next year and I will be contacting you soon. If you have villas tht sleep more people, please let me know, because from the stories we told from this trip, we have more family to be joining next year. Thank You so much again for being a part of a great vacation. Hello Lee & Alyson. Our apologies for the delay in writing but things have been very hectic since we arrived home! Anyway,many thanks to you both and your colleagues in Florida for making our family holiday at Sunset Villa such a wonderful occasion.This was the second time we have stayed in one of your villas and once again it certainly did not disappoint! There were 14 in the party,9 adults & 5 children (aged 4mths to 11yrs) and there was ample room for everyone.All facilities were as expected and once again to a very high standard. We flew into Sanford this time (only 1hrs drive away) and had no trouble finding the villa following your excellent directions. As we have been before we knew that all the theme parks/shopping malls/restraunts/golf courses etc.were conveniently close by which makes the location of the villa ideal! We would not hesitate in recommending "Disney Sunshine Villas" to anyone and will certainly be back again. Thanks once again. Ian & Ann. We have just returned home from your Sunset Villa and I just wanted to say we had the best Holiday ever. We had never been to Florida before and it was fantastic. The villa was brillant, there were 8 of us in total, 2 families and we all had our own space and we all loved the pool and hottub. On arrival the house was very clean and it was better than we expected. The pictures on this website and the additional ones you sent us via e-mail are a very good reflection of the house and are up to date. The villa is very well furnished and the leather sofa's in the living room were nice and comfortable and we loved the large screen TV. It was also good to have high speed internet. The children had the upstairs bedrooms and we had the two downstairs suites. The pool area is fantastic and it was so nice to have the garden fenced so you are totally private. The kids just loved having there own pool in the back garden which is something we just don't have at home. The gamesroom was also great and the kids loved playing pool. The house is in an ideal location, close enough to the attractions but quiet enough for 'chilling out' after hectic days in the theme parks. We met Steve and Dee your house managers who dropped by to say hello which I thought was really nice. Thanks again for letting us rent your beautiful villa, we will come back again and I would have no hesitation in recommending you to friends. I stayed at the Disney-Florida Villa with my friends and family from July 5th -July11th. I was celebration my wedding there and we all had a great time. The Orlando Int. airport was close by the Villa which was really convenient. I'm from Chicago and booked everything online and it was the easiest thing ever. The owner was very fast and helpful in answering all my questions. The photos were very accurate. The place was clean and the pool was amazing! We spend all of our nights in the pool. I would definitely recommend this property to anyone who want's to have a great time in Florida! Just thought I would drop you a quick note to say Thank You, we thoroughly enjoyed our recent stay in your lovely Villa. The villa was very spacious, spotless when we arrived and had everything that we needed for our holiday. The location of the villa is also great with the theme parks just a short distance away. I also managed to get a round of golf in whilst there, the course was brilliant with lovely scenery, also saw a couple of alligators! The down side was I lost billions of balls in the lakes so will need to stock up again. The service was friendly and we are sure to return and stay with you again. Deposit: 20% deposit required for reservations made more than 10 weeks prior to your arrival. Remaining balance of 80% required 10 weeks prior to arrival. Reservations made with 10 weeks of arriva, full payment required at time of making reservation.